The University of Lynchburg just became the first private college in Virginia with a Level One Certified Green Restaurant® on campus. The certification from the Green Restaurant Association acknowledges practices in Burton Dining Hall that reduce the environmental footprint of feeding hundreds of people each day. Operating sustainably is both the right thing to do and an expectation at Lynchburg, according to Michial Neal, dining services co-director and chef. “I’ve always recycled. It’s been important to the students for as long as I’ve been here,” Neal, who has been at Lynchburg for 30 years, said. “But now we’re being recognized by an outside entity for the efforts and initiatives that we’re doing. It gives us validity. 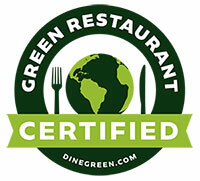 The Green Restaurant Association certifies a dining establishment’s environmental friendliness based on a variety of factors, ranging from Energy Star cooking equipment to water-saving mechanisms. Sustainability has been a focus in Burton Dining Hall for a long time. The grill hoods automatically deactivate when the grill is not in use, reducing how much conditioned air gets sucked outside. The dishwashing machine has water-saving features. Environmentally friendly cleaning fluids are used whenever possible. The commitment extends to the menu, too. Shaun Dearden, dining services co-director and operations manager, said food comes from local producers using environmentally friendly practices as much as possible. Food preparation scraps in Burton Dining Hall are set aside and composted at the nearby urban farm Lynchburg Grows. The University is exploring options for composting leftovers, too. “Sustainability touches on a lot of things. It’s the actions we take in the dining hall, but it’s also the relationships that we have with our vendors and the products that we’re serving to our students, faculty, and staff,” he said. A year ago, the Dining Hall upped its sustainability game. It began sending some of its food-production waste to the urban farm Lynchburg Grows for composting. That is the result of a University of Lynchburg student project that helped Lynchburg Grows establish a composting program. In Fall 2018, the Dining Hall replaced Styrofoam plates and cups with paper products that can be composted or recycled. In January, Dining Services partnered with County Waste, a single-stream recycling service provider based in Lynchburg, to start recycling much of the packaging and other waste from the dining hall. That provided the last points needed to reach the Certified Green Restaurant level, Neal said. More changes are on the way, too. Neal and Dearden have been in discussions with another farm about composting post-consumer waste,such as leftover food and used napkins. Once that plan is implemented, Neal expects the dining hall’s landfill waste to be as much as 70-percent lower than it was a year ago. In addition to being more sustainable, his goal is to have Burton climb to higher levels of certification with the Green Restaurant Association. The dining hall’s commitment to sustainability is a reflection of a broader campus commitment to caring for the environment. All campus electricity comes from renewable sources, and decisions over the years have led to greatly reduced energy usage and stormwater runoff. That commitment means that Dearden and Neal have the backing of campus leaders when they propose changes that make dining at Lynchburg a little greener. “This doesn’t happen without their support,” Dearden said.